Lawrence Berkeley National Laboratory has just released a report on “The Impact of City-level Permitting Processes on Residential Photovoltaic Installation Prices and Development Times: An Empirical Analysis of Solar Systems in California Cities.” You can read the full report via the link above, or you can read the Abstract and Conclusion below. (h/t to NewEnergyNews for the find.) The key conclusion is basically what we already knew — onerous city-level solar power permitting processes (which are completely unnecessary) increase the costs of residential solar power systems and increase the time needed to get a system installed. More detailed information below. Business process or “soft” costs account for well over 50% of the installed price of residential photovoltaic (PV) systems in the United States, so understanding these costs is crucial for identifying PV cost-reduction opportunities. Among these costs are those imposed by city-level permitting processes, which may add both expense and time to the PV development process. Building on previous research, this study evaluates the effect of city-level permitting processes on the installed price of residential PV systems and on the time required to develop and install those systems. The study uses a unique dataset from the U.S.Department of Energy’s Rooftop Solar Challenge Program, which includes city-level permitting process “scores,” plus data from the California Solar Initiative and the U.S. Census. Econometric methods are used to quantify the price and development-time effects of city-level permitting processes on more than 3,000 PV installations across 44 California cities in 2011. Results indicate that city-level permitting processes have a substantial and statistically significant effect on average installation prices and project development times. 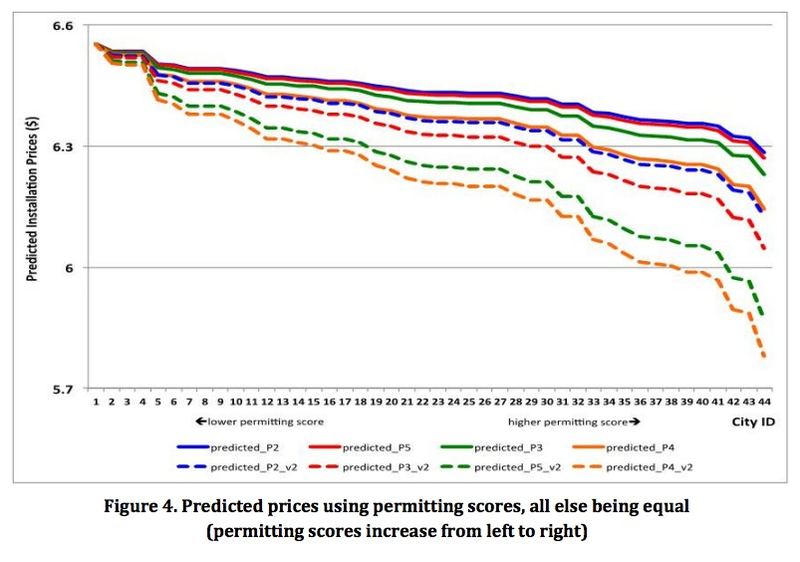 The results suggest that cities with the most favorable (i.e., highest-scoring) permitting practices can reduce average residential PV prices by $0.27–$0.77/W (4%–12% of median PV prices in California) compared with cities with the most onerous (i.e., lowest-scoring) permitting practices, depending on the regression model used. 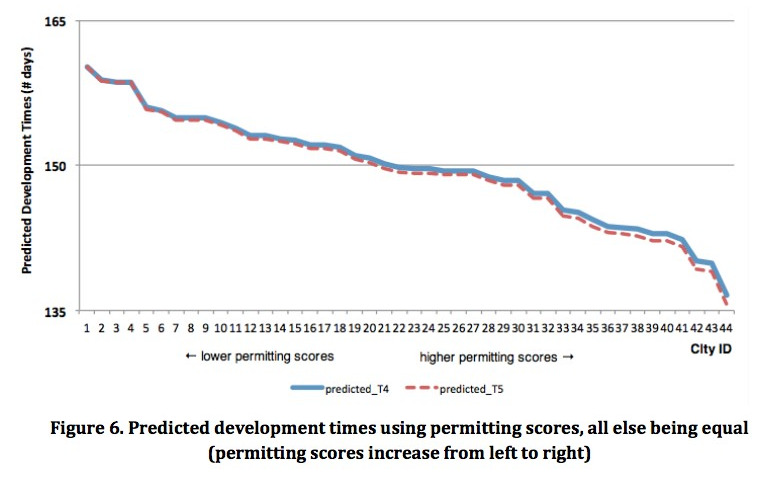 Though the empirical models for development times are less robust, results suggest that the most streamlined permitting practices may shorten development times by around 24 days on average (25% of the median development time). These findings illustrate the potential price and development-time benefits of streamlining local permitting procedures for PV systems. Non-hardware business process (or “soft”) costs currently account for well over 50% of the installed price of residential PV systems in the United States,and understanding these costs is crucial for identifying further PV cost-reduction opportunities. City-level permitting processes—as one core element of business process costs—appear to have significant effects on installed PVprices and, though the analytical results are less robust, on project development times. Among the sample of California cities analyzed, those with the most favorable permitting processes are found to reduce average residential PV system prices by $0.27–$0.77/W (4%–12% relative to median pricing) and shorten development times by around 24 days (25% compared to the median development time) compared with citieswith the most onerous permitting practices. The range of values depends on the regression model used, and results are more stable and persuasive for price impacts than they are for development-time impacts. Overall, these cross-city results are consistent with and add to previous attempts to quantify the national or regional average impact of permitting on installed costs and development times (e.g., Sunrun, 2011; Ardani et al., 2012; Clean Power Finance, 2012). In particular, they demonstrate that national or regional average impacts can mask the more substantial impacts that occur at a local level across individual cities. These findings provide some confirmation that the scoring mechanism used in the DOE Rooftop Solar Challenge is capturing real effects and, more importantly, illustrate the potential benefits of streamlining city-level permitting procedures for residential PV systems. Specifically, our results suggest that, all else being equal, streamlining the permitting process could potentially reduce the price of a 4-kW residential PV system by $1,000 or more, 28 on average, and cut development time by about a month. As indicated earlier, multiple local, regional, state, and national efforts are already underway in the United States to streamline and bring down the cost of local permitting procedures. Streamlined procedures must take care to adequately fund local governments for their time while not eviscerating the benefits of permitting for protecting consumers, promoting public safety, and rewarding the most diligent installers. Commonly discussed elements for streamlining are described in detail in other studies (Brooks, 2012; Stanfield et al., 2012; OPR, 2012), including the following: (1) developing regional or state-wide technical and procedural requirements to minimize local variations; (2) creating clear guidelines and checklists on permitting procedures and timelines; (3) using simple, standardized online application forms;(4) minimizing the number of departmental reviews; (5) limiting wait times; and (6) lowering permit fees.It is also increasingly recognized even within the solar community that responsibility for the present permitting challenges must be shared (because the source of delay is often inadequate documentation submissions by installers) and that a streamlined procedure should offer benefits not only to solar installers and their customers, but also to city permitting departments (Stanfield et al., 2012). Though the simplified and streamlined procedures used in Germany (Seel et al., 2013; see also the PVGrid project29) may not be wholly transferrable to the United States, reforms can clearly help lower the cost of and speed PV deployment.